Skin whitening has literally become a basic need for the people especially women across the world, but it is more desired in sub-continent region, in countries like India, Pakistan, Bangladesh, Srilanka, Nepal etc, where it is considered basic characteristic of charming personality. Majority of the people in this region are fall a prey to the complex, that fair skin is the guarantor of success in life, in their views, white skin is necessary for a good job and match for marriage. On the other hand, we find white people in the western world, who love tanned skin that is relatively darker in tone. We see loads and loads of people there taking sun baths, on the beaches and roof tops, just to get that darker skin tone, that the people of sub-continent acquire naturally. So the need of skin whitening or skin darkening in my view is just a complex, where people think they do not look good or attractive in their natural skin tone and then start trying various methods to get the desired skin tone. Skin whitening products range from creams to lotions, tablets to capsules, injections to skin patches, A lot of skin whitening product range is available now a days. Skin fairness is multi-billion dollar market in the regions where majority of people have darker skin complexion naturally. Not only the big multi-national FMCG companies but a lot of pharmaceutical companies are also producing and marketing their skin lightening and whitening products. Many skin lightening products also contain corticosteroids that can impart some adverse effects, if used for more than few months. These agents can cause skin as well as organ damage. A natural amino complex agent 'Glutathione' is also used for skin lightening, brightening and lightening now, it is available in capsules and injections form. Skin whitening products work by reducing the amount of melanin in the skin. Melanin is the agent responsible for the color of the skin, the more the melanin the darker the skin will be. So all the skin fairness products work by either inhibiting the production of melanocytes or by reducing the melanin levels in the skin. Some products also contain vitamins, minerals, cleansing and bleaching agents. The vitamins and minerals in such products may help in reducing oxidative stress and repair damaged skin cells. 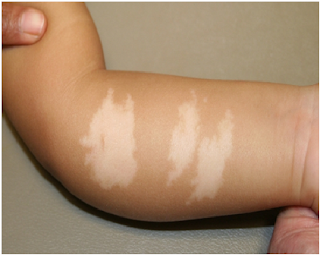 Hypopigmentation caused due to use of corticosteroids. Topical corticosteroids are the most common ingredient in the formulation of skin whitening creams. Topical corticosteroids were first discovered in 1952 and now a days these are vastly used in skin whitening and other skin related formulations. A recent research has shown that 76% of female and 24% of male are using these low quality products and 70% of people belong to urban cities. These fairness complexed people easily get impressed by companies that assure them of skin fairness within small period of time. Patients using these steroidal creams should be aware about these formulations and their adverse effects. People use such formulated products to get rid of acne , dark spots, melasma, wrinkles, freckles and dark complexion. These products do exert a quick result, that make people believe that these are accurate and effective products but in long term these are very dangerous for facial skin. These products may cause skin thinning . These agents may be carcinogenic and cause skin cancer. It makes skin senstive to even sunlight. The long term use of Corticosteroids may cause acneform eruption , steroid addiction, red face syndrome, hypertrichosis associated with severe redness, burning and scaling on the face. It may damage the skin cells badly.These creams are easily available Over-The-Counter. Topical corticosteroids are used in combination with bleaching agent hydroquinone and mercury. Long term or full body use can cause mercury toxicity. Lack of awareness and financial problems make it difficult for common people to consult an expert dermatologist, fairness obsession lure the patients to use these creams to achieve the desired skin whitenining effects, quickly. Most of the damage because of these steroidal creams are not clearly visible because the damage may occur beneath the skin to the vital organs.Creams containing hydroquinone can lead to paradoxical hyperpigmentation .A powerful steroid CLOBETASOL should never be used on the face, a senior dermatologist Shyam Verma, Said. The steroids are used to treat inflammatory disorders, but one of its adverse effect is thinning the skin. “No cream can change the original complexion of the face'' said by a dermatologist. The steroid based creams are very useful for the patients with acne or any fungal infection, but using them just for fair complexion and prolonged use is very risky and may cause severe skin disorder such as contact dermatitis, talangectasia also known as spider veins, hyper or hypo pigmentation, delayed wound healing, peeling of the skin, skin irritation, burning sensation and stinging etc. Advertisements for fairness creams must be banned because these advertisements psychologically attract people and force them to try these creams for sure quick results. There is a need for awareness about the adverse effects of these preparations to the people using these for long periods of time. In future i will write about skin cleansing and lightening with natural sources that are healthy for the skin and free of any side effects. Now whiten your skin magically fast with these incredible skin whitening tips buying free. If its sweetness and rich flavors aren't enough to make them irresistible, right here is but any other feather to the crown of Papaya – it is an excellent pore and skin whitening agent.